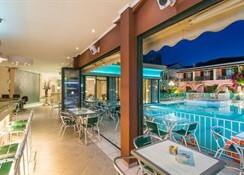 Sofia''s Hotel Complex is a modern style property, it consists of 4 separate buildings with 50 rooms which all have their own balconies ''Terrace and are surrounded by beautiful gardens. 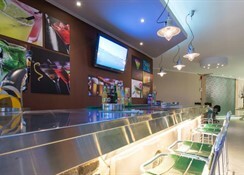 Sofia''s Hotel features a Sports & Entertainment Bar, a swimming pool and a Super Market. It is a great choice for any kind of holiday maker including couples, families and groups of friends as it is located in the heart Kalamaki but also very close to other well known tourist resorts. Additional facilities of the hotel: reception( 09:00 - 18:00) Room facilities: Double Bed(s) on request but not guaranteed. Kitchenette includes 2 ring hob & cooking utensils, full size fridge, Kettle. Free cot available on request (Subject to availability). Air Conditioning (Optional - Extra Charge Payable Locally) Double Bed(s) (Upon Request but not guaranteed) Safety Box (Optional - Extra Charge Payable Locally).